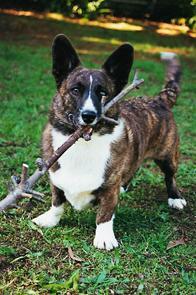 The Pembroke Corgi originated from the hardy, bob-tailed cattle dogs of the Pembrokeshire area in Wales. Due to being chosen as a pet by the British Royal Family in 1935, the Pembroke Welsh Corgi is now one of the best-known breeds in the world. It is highly successful in both show and obedience rings worldwide, and extremely popular as a family pet. The Cardigan Corgi - the Corgi with the tail - is one of the oldest of the Welsh dog breeds and is generally acknowledged as being the original Corgi or dwarf dog of Wales. Since ancient times it was used as a sheep and cattle herder, a guard dog, and friend and companion in the lonely crofters' huts of the remote Welsh hillside country of Cardiganshire. Corgis can live up to 17 years of age. The breed's heritage endows it with all those valuable instincts of a working dog and the independent spirit that originally enabled it to control the Welsh cattle without undue direction from its masters. It is truly man's best friend and helper. The Cardigan Corgi, with its ancient lineage, has retained its individual character, particularly its steady and sensible nature. A Cardigan is equally at home on a large property or in a smaller suburban yard, and with its exceptionally sensitive hearing makes a wonderful watchdog. The Corgi's beautiful short coat requires only a quick brush to keep it clean and shiny and an occasional comb to keep the undercoat and skin in good condition. Puppies require long periods of undisturbed sleep, and close supervision when at play. In particular, owners need to ensure that children do not inadvertently drop them. When bored, Corgis can become noisy, so responsible owners should always ensure that their dog has activities to occupy its day. The Corgi is definitely a compatible canine companion, and they make delightful children's pets, but supervision is a must. Owners should be prepared to train their dogs to be disciplined in play and not get over-excited.